Every time I think I have finished this small watercolor sketch, I find something else to do to it. I began the work while sitting in my booth at Art in the Park last spring in Kennedale, Texas. My reference photo is a small 3 x 5″ photo I took with a throw-away digital camera purchased years ago before I bought my own Nikon. 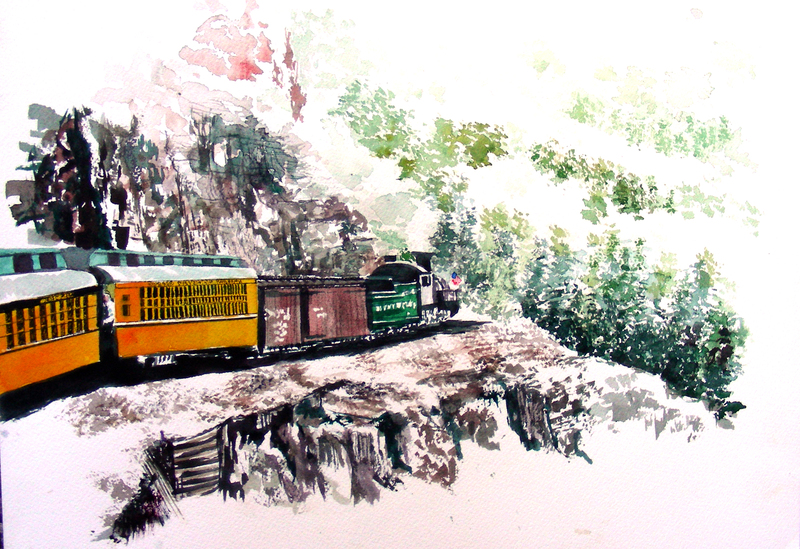 I had the privilege of sitting near the back of this train, and was able to photograph the front portion of it as it wended its way around the mountains between Durango and Silverton, Colorado. I still haven’t managed to capture the steam billowing out of the engine, and feel that I’m going to have to do some scrubbing with a towel or maybe even some sanding with light-gauge sand paper and begin again. I really want to show the steam. I’m also not satisfied with the misty trails in the distant valley to the right. I feel that it looks as though I just quit on the foliage. I believe the cliff face in front also needs additional work on the deep shadows, and there are some details with the yellow passenger cars that I forgot to finish out. Anyway–plenty more “playing around” left to do on this way. All the same, I wanted to post it on the blog, so here it is. Hopefully I’ll show it again when I get it where I want. It’s a small piece by the way, about 12 x 16″. As a vacationing Texas school teacher, I refuse to give in to the hot summer doldrums. Yes, today was another triple-digit day, with plenty more in sight. Nevertheless, I set set my sights on yet another plein air excursion that would take me 226 miles down hot Texas roads, and would burn up the entire day. But by day’s end I consider the excursion worth it, though I’m bone tired as I post this. I hadn’t visited Granbury in a little over a year, never forgetting what a good experience it was, watercoloring in that Victorian town. Though this Victorian was built only eleven years ago, it has that delightful “look” that holds my gaze and makes me want to paint. 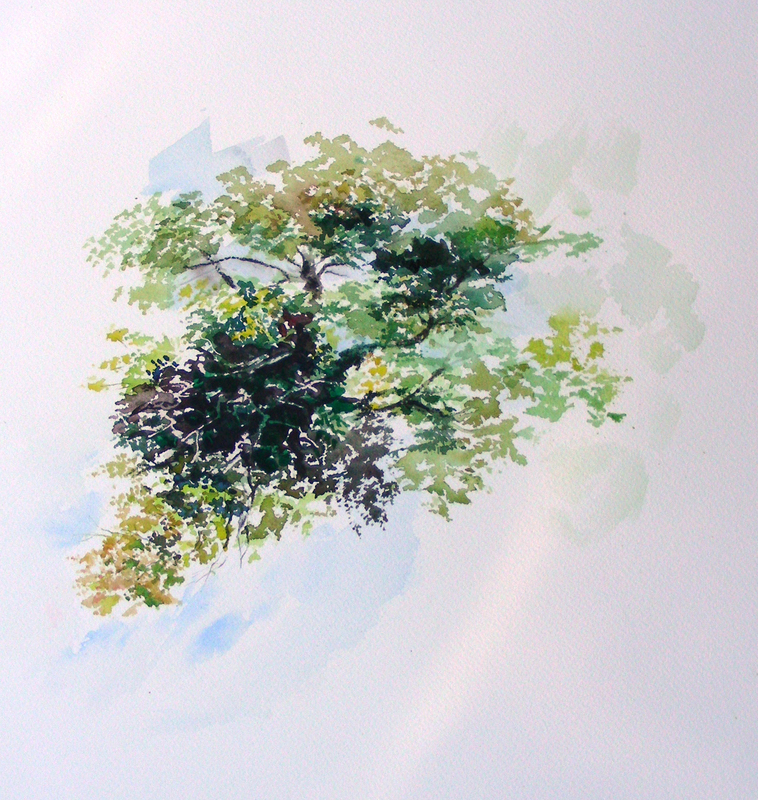 Fortunately there was a huge tree throwing its shadow across the cross street, and I found the morning temperatures (in the shade) to be quite pleasant for the painting experience. Granbury is a friendly town, and the neighbor to this residence walked down the street to greet me and to visit for awhile. He gave me excellent background to the architecture surrounding me, and I hope to get back before long to paint the rest of the neighborhood with its beautiful architecture, fencing and landscaping. After about 90 minutes, I decided that this one was finished enough and that it was time to find some lunch and move on to the next painting. That would turn out to be in Hico, Texas. That painting I’ll reserve for the next post. I’m surprised at how quickly this composition is shaping up. It measures 20 x 24″ and I began it yesterday evening with only about an hour of daylight remaining. I took a reference photo of this 1903 cabin in Cotter, Arkansas when I was visiting there last May. 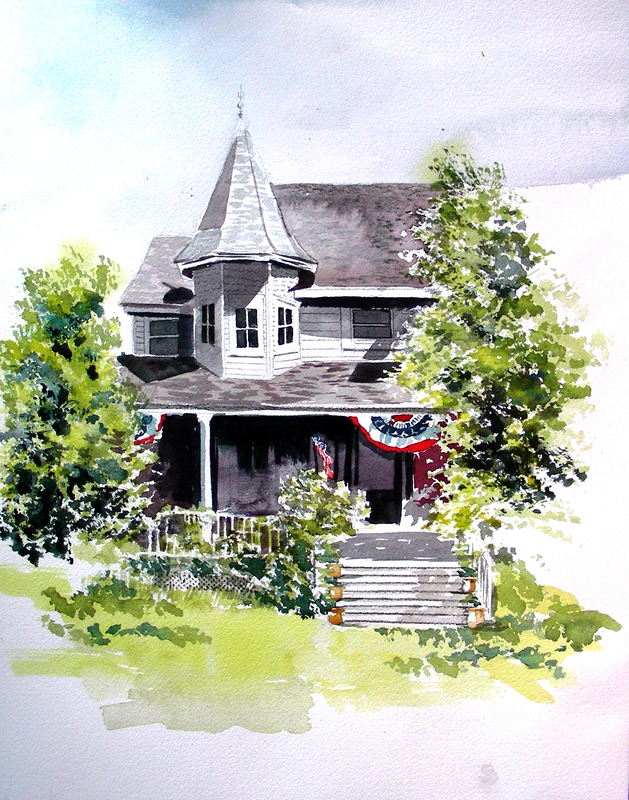 I actually did a plein air watercolor sketch of it during that visit, devoting about 90 minutes to the session. I blogged it in an earlier post. Though it’s taken over a month, I’ve had it on my mind to do a larger studio watercolor of this sketch, using the photo. I love working from natural light so much that I choose not to work on it inside my house. So, today, with temperatures soaring past 100 degrees again, I spent the morning and evening in my open garage working on it, ever so grateful for gusty winds (though at times they gave about as much relief as a hair dryer). In order to work on this, I’ve spent considerable time poring over Andrew Wyeth drybrush studies of frame houses and barns. I’ve also looked carefully at how he renders grasses in watercolor. It surprises me that I’m moving so quickly through this piece, when I thought that I would be working slowly and methodically. When it comes to the ongoing art historical debate between the Poussinistes and Rubenistes (drawing vs. painting/Nicholas Poussin followers vs. Peter Paul Rubens followers–sorry, just had to throw that one in! ), I always came down on the side of Poussin, Wyeth, and all others who approach painting as an extension of drawing. For decades, I’ve wanted my own watercolors to model fine draftsmanship. But over the past couple of years, I’ve tilted more toward color exploration and quality, and have found myself moving away from drawing. Drawing always slows down my work. I guess I’m surprised that I’m not spending more time drawing in detail on this piece. But . . . the painting is not yet finished. Who knows–perhaps tomorrow I’ll return to drawing and slow my pace. We’ll see. The bottom line is that I’m having fun with it. 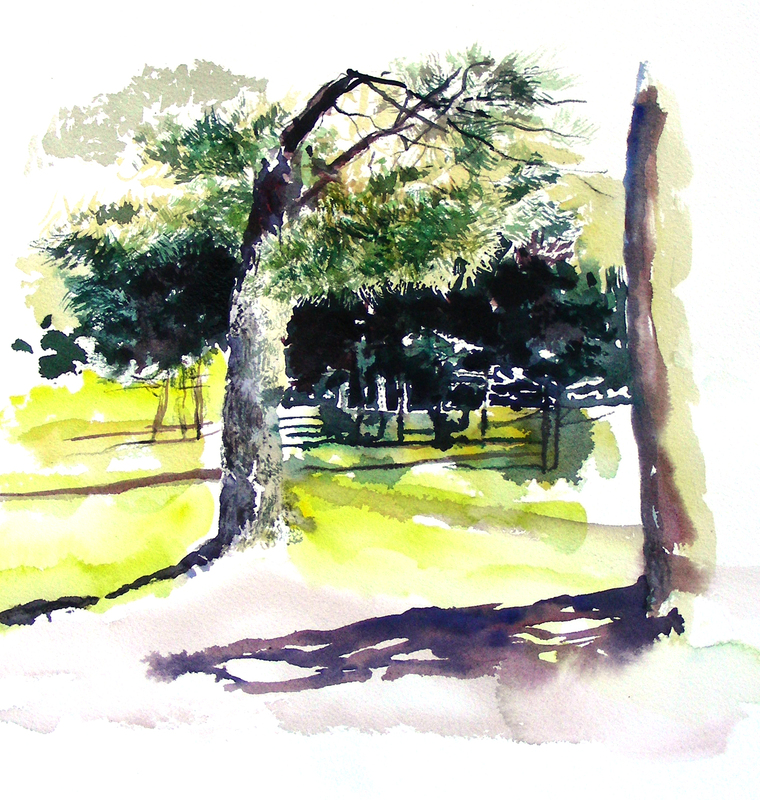 I rose at sunrise earlier this week, and tried my hand at plein air watercolor at Stovall Park in south Arlington, Texas, about 5 minutes from where I reside. I found the warm sunlight alternating with cool shadows extremely delicious and wanted to try and capture some of that on paper. I worked on it long enough to realize that I had no clue how to render the pine needles in the foreground tree. So I finished blocking in the rest of the composition with wet-on-wet layers and called it quits for a few days. Late this afternoon, I set up my easel in the garage, took another look at this sketch, and decided to consult Andrew Wyeth, my patron saint, my guiding force, my all-around heroic drybrush Meister. Perusing a series of his drybrush sketches rendered en plein air at Kuerner’s farm led me to take another crack at this quick composition. I pushed it about as far as I could go, then worked to get the background shadows much deeper, hoping to set off the pine needles more effectively. I think I’m going to return to Stovall and try another of these. Pine trees have intimidated me for too many years now. It’s past time to do something about them. Thanks for reading. It’s been a delightful day painting. Glad there is still plenty of summer left. With the Texas temperatures more tolerable in the evenings, I returned to my garage studio to give plein air another whirl. If you have been following my blog, you’ll recognize this one that I started a couple of weeks ago after a class at the Eureka Springs School of the Arts. The sun dropped and all the flowers fell into deep shadow so I stopped. When I got home and searched for a reference photo, I was dismayed to find out that I did not take one from this angle. I had a number of digital photos of this setting from an extreme side-angle. So I had to “fake it” as I finished this one out. 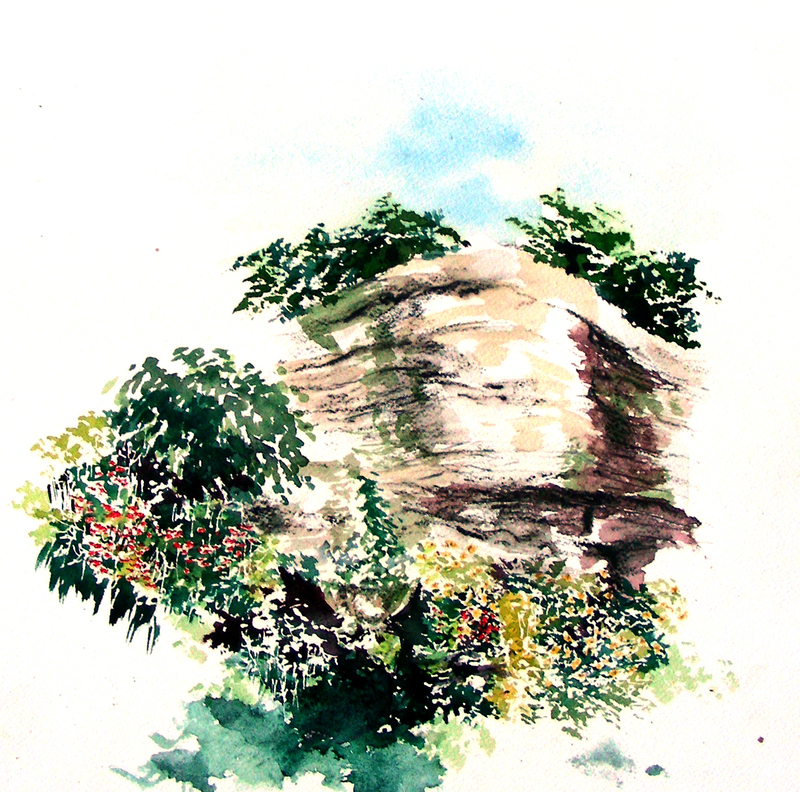 I simply added more darks around the flowers and at the base of the bluff. Then I added more background trees to the upper left hand corner of the composition. 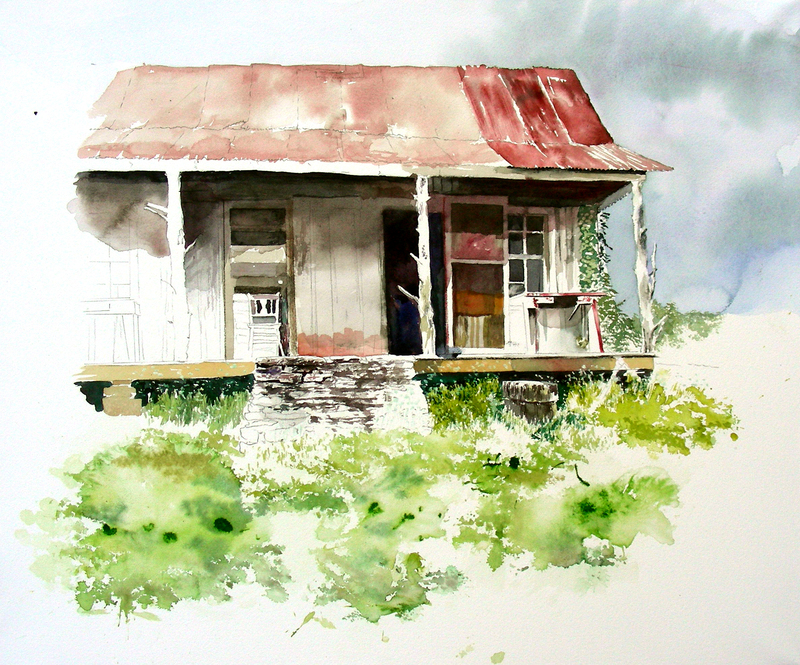 Finishing this composition took me back to Eureka Springs, in pure Proustian fashion. I enjoyed the mental re-visit and was somewhat sad when I stopped working on this. Another chapter closed. It’s bloody hot in Texas already, registering daily triple-digits for about two weeks now. I was spoiled in the Ozark Mountains of Arkansas the past two weeks, waking to morning temperatures in the 70’s. 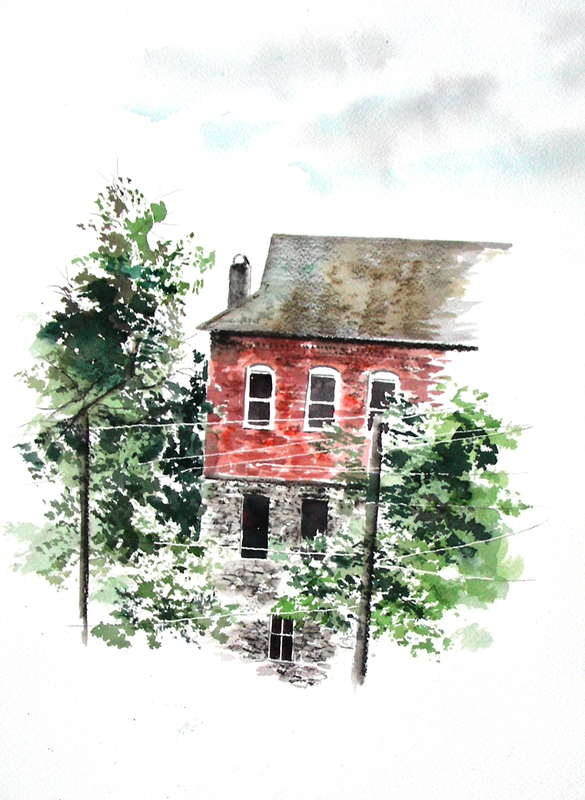 Today I decided to give plein air a try anyway, from the open door of my garage. Standing in the shadow, I looked at my next-door-neighbor’s tree in the sun, taking in the warm sunlit leaf patterns, and peering into the cool, dark shadows where limbs and boughs were barely visible. Quickly assembling my portable easel, I gave it a try. I have always been dissatisfied with my watercolor handling of leafed-out trees (naked ones too–I just don’t like the way I “do” trees). Nature’s green has frustrated me as a painter my entire life. Therefore, I decided to wrestle only with the crown of this one tree, and do my best to match colors with its grandeur. I spent the entire morning trying to sort out the reddish-tinted greens from the gold-tinted ones. I also tried to find out what combinations of colors will “work” in the shadows. I took my sweet time on this one, thoroughly enjoying the experience, though not certain of the painting’s outcome. I spent some time during rest breaks (allowing the watercolor to dry) reading Xie He’s Six Canons of painting from the early 6th century. I was trying my best to distill the essence of this particular tree crown that I was studying all morning. Maybe I’ll decide by tomorrow what I think of this one. I’m not satisfied, but am not sure just yet what is bothering me about this painting. I believe it a worthy goal this summer while out of school to attempt to “solve” my tree-and-natural-green problem. Thanks for reading. It was an enjoyable morning for painting. A hot, humid, sticky day in Arkansas, thanks to midnight thunderstorms the night before. Our plein air class from the Eureka Springs School of the Arts began the morning at the Turpentine Creek Cat Refuge south on Highway 23 out of Eureka Springs. My students asked me to do a demonstration, painting a slumbering Bengal tiger in the shadows. I tried. She turned over about a dozen times in the first 10 minutes. My attempt of course was a disaster. The students paintings that ensued however showed much more promise. Our afternoon session was spent on Spring Street near where I am residing this week. The students gravitated toward this beautiful bluff and flower bed shimmering in the sun. They called my bluff, asking me to do a painting demonstration of this scene, knowing I had never tried to paint a large natural rock surface. I suppose I did O.K. on this (much better than on the tiger, which I won’t bother to post!). After the students finished at 4:00, I noted that two students wished to remain for about another hour. So I took this sketch back out, having only roughed out the bluff, and tried to knock out some flowerbeds (another first for me). I lost the light as the evening shadows lengthened, so I will need to come back to this one. The flowers and foliage are not quite finished. An inspiring day for plein air painting, once again. Rising at 5:30 this morning, I emerged into the beautiful Eureka Springs morning light, and was surprised and gratified to find this spectacular vista from the rear porch of where I am residing. Incidentally, the Twilight Terrace at Sweet Spring has to be one of the most beautiful facilities I have ever experienced (www.http://eurekaspringsterrace.com). I thought that the scene was perfect for a quick watercolor, and was happy to kick this one out in 52 minutes, start to finish. Then it was time to run and meet my wonderful class–six enthusiastic plein air watercolor students who make me proud to be affiliated with them. The first day of class at the Eureka Springs School of the Arts is in the books. I was so excited that I set my alarm for 5:30 and arrived at the school by 8:00. Class began at 9:00. Six students this year, same number as last year, and I love them all. All of them talented, all of them enthusiastic, and all of them wanting to push their skills further by exploring plein air watercolor. We worked our first day at the school. 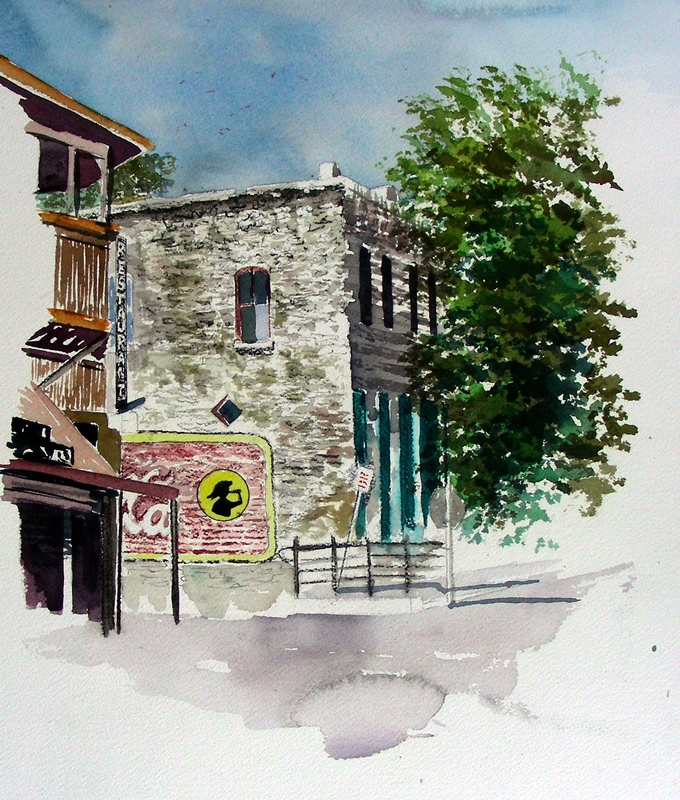 Tomorrow we meet in the historic district of Eureka Springs, and will paint the town, literally. Class went from 9 to 4. I gave myself about an hour to decompress in this lovely living facility (Twilight Terrace at Sweet Spring), then returned to the site about 2 blocks from here where I began this plein air sketch yesterday at this same time. I spent one more hour on it today and declared it finished. After all, it’s just a plein air sketch, not a finished, polished studio piece. Maybe I’ll do that some other day. 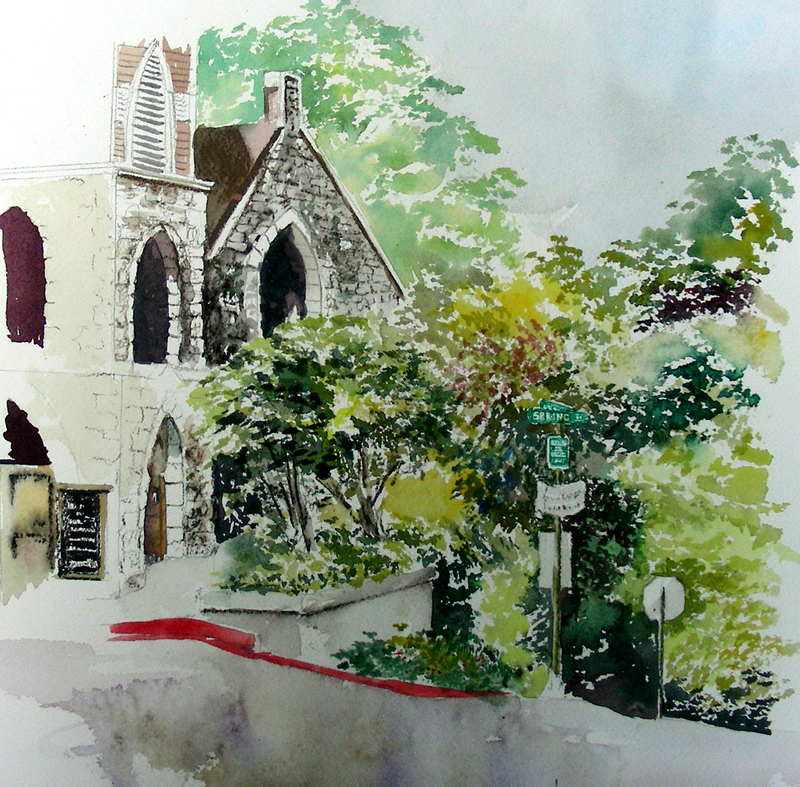 This is the First Presbyterian Church of Eureka Springs on Spring Street. When I decided to work on it yesterday, I was fascinated with the rustication on the exterior of the structure, thought about how the ancient Romans introduced that to the Western world, and fancied this as a Roman Catholic Church. Now today I read the sign and saw it was actually Presbyterian (sorry Jean!). Nevertheless, it has that Roman look (to me). And I am aware that Vespers came from the Roman Catholic tradition, drifted to the Greek Orthodox, and was later adopted by the Lutherans. But I believe the word just means “evening” and I know that Presbyterians, Unitarians and other church bodies today use that word “vespers” to refer to some of their liturgical practices. This was truly a “vespers” moment for me as I spent this evening’s hour finishing this piece. The slanting rays of the sun continued to wash the environment, and chase lavender shadows across the recessed areas of this scene. I really did not want to stop painting on it. But alas, I have overworked far too many watercolors (and may have this one as well!). So, I decided to let it go, and rest up this evening so I can teach another class tomorrow, and (hopefully) kick out another plein air watercolor at tomorrow’s vespers. Thanks for reading. 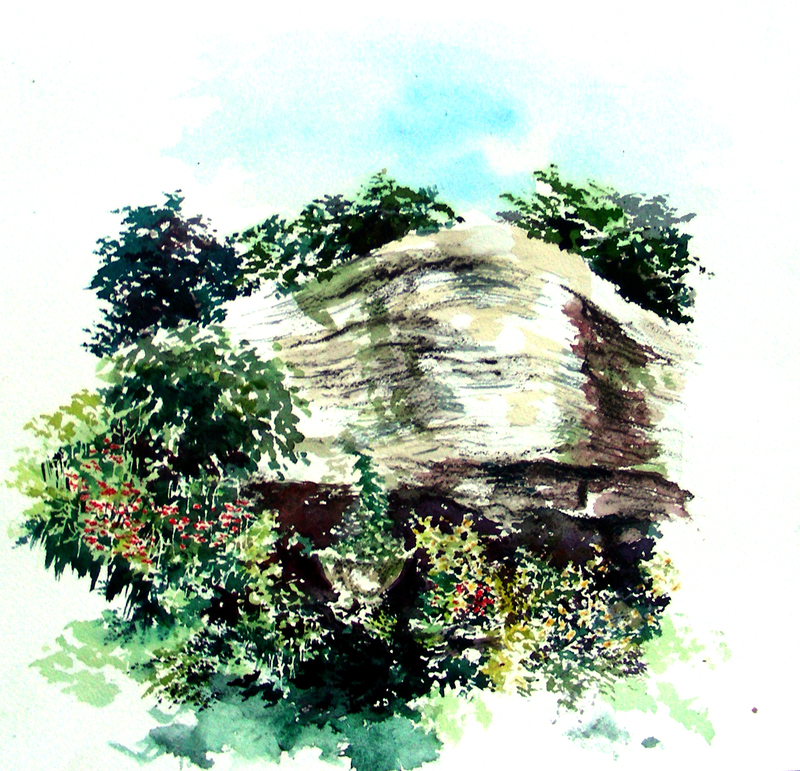 Eureka Springs is a beautiful place to paint!